One of a kind masterpiece on an oversize,private homesite with breathtaking views of the river.This gorgeous estate,with its own private deep water dock is the perfect home for entertaining with great attention to detail and architectural design.Exquisitely appointed,this home offers an open concept flow.Timeless architecture along with spacious principal living spaces.Beautifully designed chefs kitchen overlooking the family rm with a well appointed wetbar,will certainly be the hub of all gatherings.Generous master suite with luxe ensuite and private dressing rm closets make it a perfect retreat.Three other large bedrooms with posh ensuites. CASA BELLA - SPECTACULAR ONE-OF-A-KIND MEDITERRANEAN MARVEL . . . soon to be built. Buy now and choose your finishes & colors. Planned for all stone and wood floors, the finest granite and marble countertops, SubZero and Wolfe appliancesGÇöonly the best of everything! A view of the Okatie River to die for. Top all this off with a huge screened lanai with pool, spa, summer kitchen, outdoor living room, alfresco dining. Community amenities are incomparable: clubhouse, two Fazio courses, golf learning center, river club & spa and fitness center. Discounted pre-construction pricing. Gorgeous custom built home with premier manicured landscaping. 4 bedrooms, 6 bathrooms. Over 4300 square feet of luxury living.Beautiful finishes throughout, detailed coffered ceilings, extensive molding and trim. Exceptional floor plan featuring an impressive great room and family room - both with sliders to a tropical outdoor living area that features pool, spa, outdoor kitchen and more!Gourmet kitchen with large center island and top of the line built in appliances.Lavish master retreat with large custom closets, private breakfast bar and spa like ensuite.Main floor enhanced with private, perfect "guest or parent suite". Many, many extras! 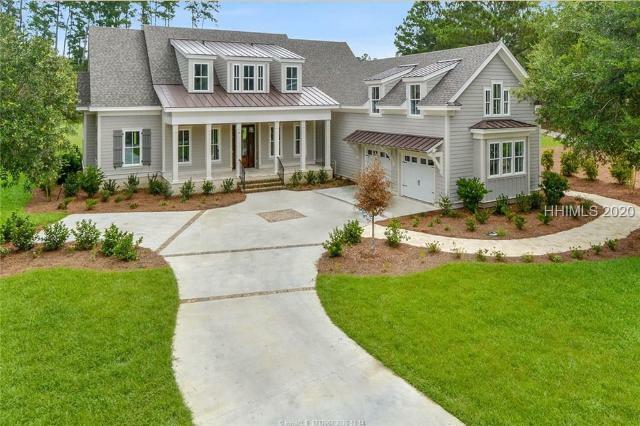 Tranquil marsh views from this Lowcountry dream home! This 4 bedroom Berkeley Hall home situated on an oversized lot has three bedrooms in the main house and a separate carriage house apartment over the garage. The open concept plan includes a gourmet chef's kitchen and family room with fireplace, a keeping room, large screened porch with additional fireplace, separate study, upstairs loft area perfect for a media or computer space between the 2 bedroom suites. White oak floors, designer details and impeccable quality throughout this professionally decorated home. The expansive yard includes a firepit for entertaining and enjoying the view. Stunning, immaculate, spacious, breathtaking, and special are a few of the adjectives that describe this home, its condition, views, and location. On a cul-de-sac adjacent to the 17th fairway of Berkeley Hall's South Course, the home enjoys spectacular views down the fairway and across an expansive lagoon. 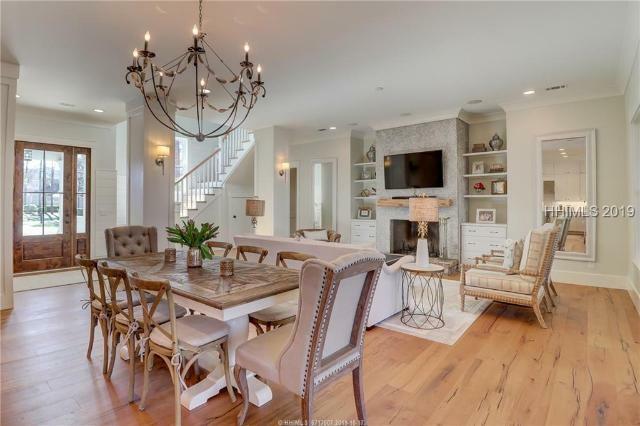 Built with exquisite detail including elevated ceilings, step-down wet bar with wine cooler, open great room, dining room, living room, screened porch, master suite with spacious closets, and recently completed pool and deck. Other features include a walk-in attic, three car garage, large walk-in pantry, and sound and security systems. An elegant custom H2 home offers natural light throughout. The open & spacious floor plan is perfect for daily life, guests & entertaining. A large wet bar opens to the kitchen & dining room. The fireplace is a central point in the great room which opens to a large kitchen & breakfast area. 4 bdrm, 4 1/2 ba, all en suite, includes a gracious master suite & an extra guest suite above the oversize 2 1/2 garage. The 2nd floor has a nursery/craft space & doors opening to second-floor porch with wonderful golf course and lagoon views. Plenty of storage throughout this stunning home. Berkeley Hall offers a quality of life unmatched on the mainland. A delightful home with the rare benefit of privacy and expansive water views over Eagle Lake. 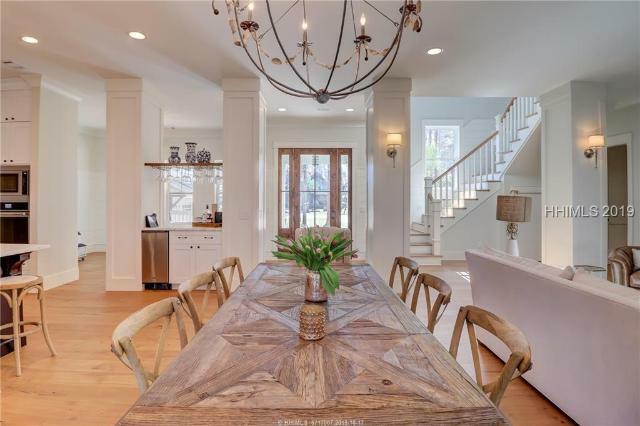 Located on one of Berkeley Hall's prettiest streets, this home offers Lowcountry living at its best. You will see bald eagles and variety of wildlife on Eagle Lake. This top-quality home includes marble flooring throughout most the first floor, impact glass, inlaid wood ceiling, stunning custom kitchen, an atrium with pool, spa and summer kitchen, extensive landscaping and more. High-end lighting fixtures throughout. Berkeley Hall offers the best of mainland living with two Fazio golf courses, river park, tennis, superb dining and so much more. 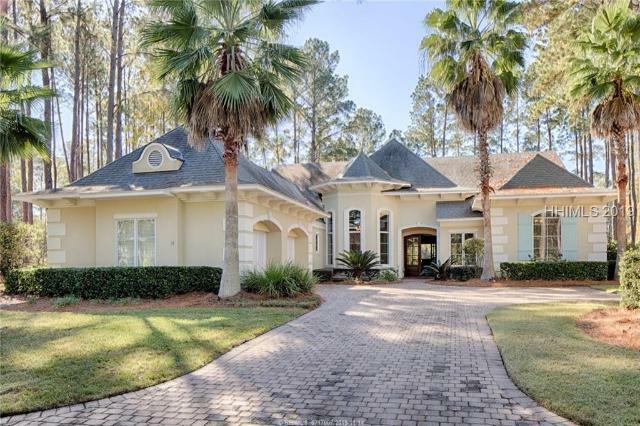 This impressive 3+1 bedroom luxury custom home provides over 4400 sq ft of exquisite living space and boasts breathtaking Lowcountry views of Berkeley HallGÇÖs 17th Hole on the south course and Blue Heron Lake. Features include an open concept great room with cozy keeping room,walkouts to a screened porch oasis with an outdoor kitchen.Luxury mstr with his/hers closets.Generous guest suites.Oversize bonus room with full bath.Berkeley Hall amenities incl two Tom Fazio designed golf courses,30 acre state of the art practice facility, tennis,river park,outstanding fitness center featuring multiple pools & spa,Jeffersonian style club house and more! This custom built beauty built by H2 in late 2016 has been a rarely used second home. Well detailed and appointed with good use of space throughout including an en suite first-floor guest bedroom. Beautiful afternoon views across the golf course from your screened porch both upstairs and down. Unfinished mid-level game room has many potential uses. Additionally, the home has a water well, space for a pool and a home warranty thru 9/21, solar shades on the first-floor porch and impact glass on the rear of the home. Berkeley offers a lifestyle unparalleled on the mainland with two 18 hole Fazio core golf courses, river park, fitness and more. 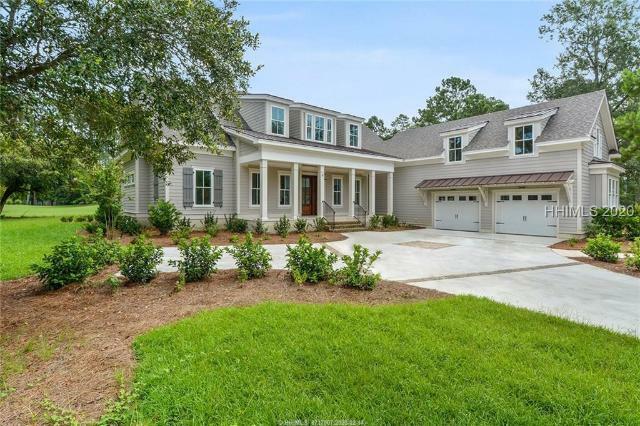 This beautiful "Low Country Charmer" is under construction and waiting for you!The home has a Hardi-Plank Exterior with a tabby foundation and architectural laminate shingles with standing seam metal accents. Featuring four bedrooms, four and one half bathrooms, an upstairs den, a future bonus room suite and much more! The outdoor living area has covered porches spanning the entire rear of the home including an outdoor kitchen area as well as a sitting area off of the master bedroom suite with an outdoor fireplace. Long golf view overlooking the 17th hole of the South course. Still time to choose some finishes! Stunning home with gracious style and beauty! Comfortable open floor plan, dramatic high ceilings, impressive architectural details through-out, telescoping glass sliding doors! Great room opens to a beautifully landscaped lanai, summer kitchen, big private pool (600 sqft), spa, & powder room. Awesome custom Berkeley Hall lifestyle home with room for the whole family to enjoy! 20GÇ¥ tile floors in main areas, hardwood floors in study, dining room, master bedroom. Fabulous kit with granite counters, island, SS appliances, big breakfast banquette, cherry cabinets. Service bar in hallway. Huge Bonus room over FOUR CAR GARAGE! Very private estate. 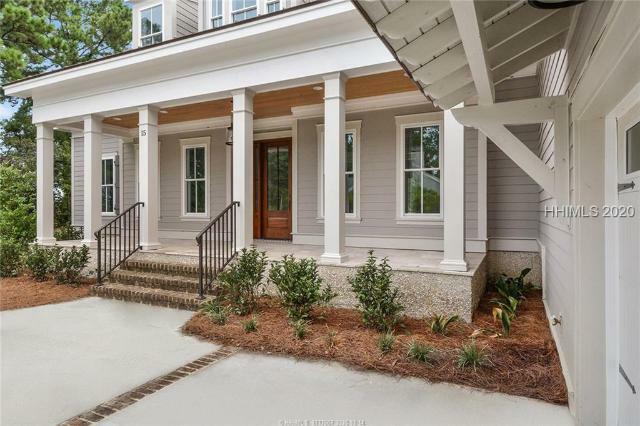 Enjoy single story living in perfectly packaged proposed construction on one of Berkeley Hall's LARGEST available private homesites. The inviting Amelia model from AR Homes, features 4BR/3.5B and the epitome of indoor/outdoor living. The screened lanai and cabana with an outdoor kitchen embrace an expansive backyard which would welcome a pool or even putting green. Given the unique position of lot, golf views can be found across the front of the home. Includes tankless water heater, insulated glass, spray foam insulation in attic, & more. Includes lot premium, $30k landscaping package & session w/ Interior Design team. This Beautiful home was built by one of the areas finest, R Best Custom Homes. Enjoy all the comforts of single story living. Open floor plan, High Vaulted Ceilings, large family room with fire place that opens onto a huge screened lanai, pool, spa and outdoor Kitchen. The luxurious master suite also open onto the covered lanai. Chefs kitchen includes, custom cabinetry, high end appliances. Formal Dining, Study with french door. Three additional bedrooms, two full baths and one half bath. You'll love calling this property home! An expansive foyer opens up to a cathedral ceiling great room with views to a beautiful pool and spa overlooking a quiet lagoon with a fountain and preserve beyond. Three first floor ensuite bedrooms and bonus room with full bath ensure that you have plenty of space for guests while the flow of the floor plan works well for your everyday living. 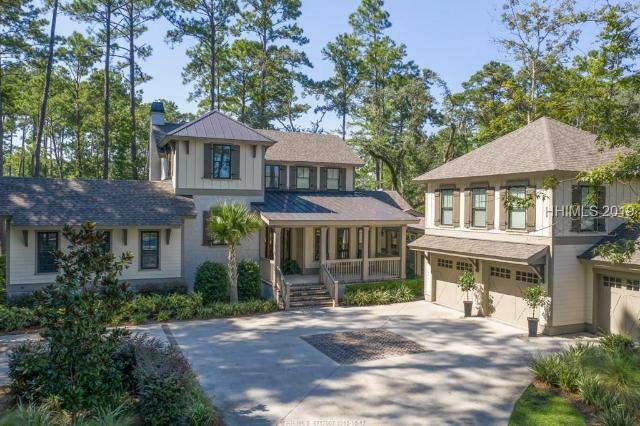 Berkeley Hall offers superb mainland living with two Fazio golf courses, community dock, superb dining, newly renovated fitness center and so much more. You owe it to yourself to see this wonderful home and the equally wonderful community of Berkeley Hall. This is the one you have been waiting for! Beautiful one owner home meticulously and lovingly maintained. 4 Bedrooms, 4.5 Baths with good bedroom separation including a huge bonus room over the 3 car garage. Like new 4 AC units, SubZero Refrigerator, LG dishwasher, outdoor landscape lighting, indoor and much of outdoor recently painted, plus a brand new 50 year roof installed! Most of the home is like new! Foam insulation for low utility bills and lots of attic storage space. Inviting open floor plan complete with outdoor living and grilling on the spacious screen porch. Huge walk in pantry and much, much more. A right sized home, this stunning St. George model was built by Best Custom homes. Open floor plan looks out on to stunning lanai with salt water pool, spa and summer kitchen. Lush landscape provides full privacy. Recently painted and in impeccable condition. Three first floor bedrooms plus bonus room, four full baths offer great space for daily life and guest space. Berkeley Hall, with core golf and two Fazio courses, is the best of Low Country living. Fully updated fitness center, pickle ball, tennis, community river park, fine dining and more. Move right in and begin enjoying your new life! Sweeping views of Berkeley Lake and the 6th hole of the Fazio Course! This 4 BR, 5 BA home features top of the line detail and quality throughout. Extremely well maintained with an open floor plan. Gourmet kitchen with all the bells and whistles. Bonus room with bath could be a huge guest suite, media room, rec room, or home office. Come and enjoy all that Berkeley Hall offers including clubhouse ,golf courses, practice facility, tennis courts, fitness center, river park and more! Sold as is where is. Rare deepwater homesite with private dock, pierhead, and boat lift available in Berkeley Hall! One of only a handful of homesites on the deepwater that have not been built on. Dock your boat in your own backyard on this great building site. Located on a quiet cul-de-sac, this one wonGÇÖt last long! See 3D VT link. Opportunity is knocking to be in one of the best Golf communities in the area! The owners' loss is your gain, over $50,000 in upgrades done since seller moved in! This outstanding home is one of the largest in the area with all the upgrades you would expect. Tile floor, Coffered ceilings, Whole house Dehumidifier, 2-Car Garage w/Golf cart bay, NEW high-end 2-stage AC unit, New hot water heaterGÇªand MORE! The lock & leave lifestyle this home offers makes all your days relaxing! The floor to ceiling window wall slides open to a beautiful covered lanai with pool & hot tub. DonGÇÖt let this one slip by you. Start living your dream!